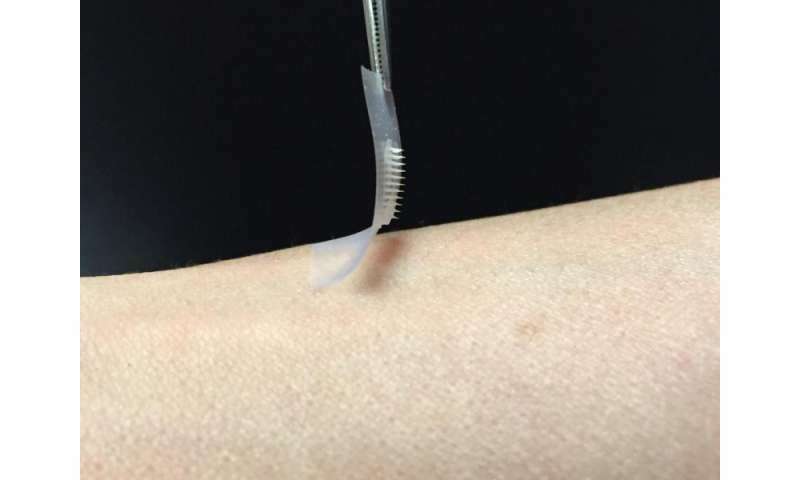 The "smart insulin patch," developed by researchers in the joint UNC/NC State Biomedical Engineering Department. Credit: The lab of Zhen Gu, Ph.D.
"We have designed a patch for diabetes that works fast, is easy to use, and is made from nontoxic, biocompatible materials," said co-senior author Zhen Gu, PhD, a professor in the Joint UNC/NC State Department of Biomedical Engineering. Gu also holds appointments in the UNC School of Medicine, the UNC Eshelman School of Pharmacy, and the UNC Diabetes Care Center. "The whole system can be personalized to account for a diabetic's weight and sensitivity to insulin," he added, "so we could make the smart patch even smarter." 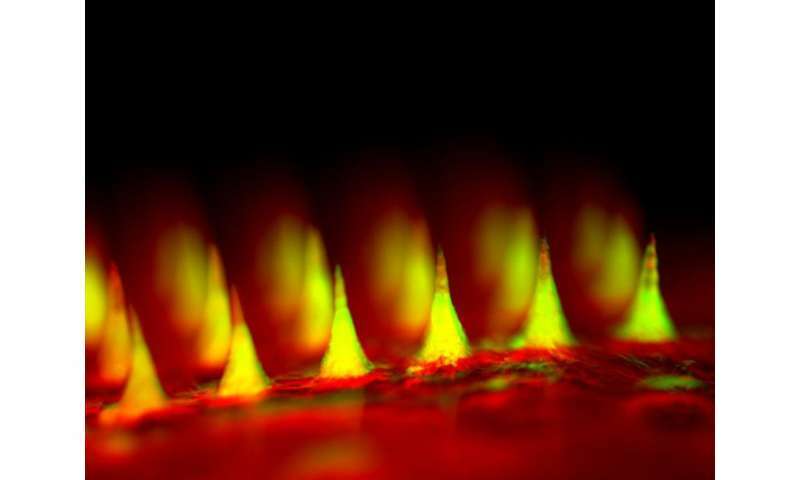 An up-close fluorescent image of the microneedle patch with insulin tagged in green. Credit: Zhen Gu, Ph.D.
"We constructed artificial vesicles to perform these same functions by using two materials that could easily be found in nature," said PNAS first author Jiching Yu, a PhD student in Gu's lab.